One thing many students, the Student Government Association and the Georgia State University Police Department can all agree on is the abounding need for a secure campus, specifically through the enhancement of surveillance camera technology. SGA executive vice president on the Newton Campus Aarjavi Patel brought forward the issue of campus security when a friend of hers had her car damaged in the parking lot. Her friend reached out to GSUPD for footage of the incident but was told the proof could not be provided. Following this, Patel said she began to inquire into the security system on all Perimeter Campuses and found that many of the cameras were non-functional, and in some parking lots, there were no cameras at all. Patel corresponded with the GSUPD captain on this issue. He provided proof of this success in the Newton campus’ very low crime rate and recommended using the services provided by GSUPD for additional safety, such as police escorts or the LiveSafe App. According to the Georgia State Safety and Security statistical reports, the Newton campus has not had a single criminal incident across a variety of categories for the 2015, 2016 and 2017 years. In 2017, the Alpharetta and Dunwoody campus also had no incidents, and the Decatur campus had two incidents. The Clarkston campus had the most incidents of the perimeter campuses at eight in total. However, the main Atlanta campus vastly suprasses all campuses with 59 criminal incidents in 2017. Despite the safety of Newton campus, Patel responded to the email, saying that there is still a need for more security cameras. “There are areas that need some just to be safe because you never know what can happen at any time of the day or night,” she said. Patel continued to investigate solutions by reaching out to further sources and said she received a call from the captain where she was told that the solution was already given and they did not have the proper budget for installing cameras. “I am not letting this go since this is an issue that needs to be solved before an tragedy occurs and there are no suspects to be caught or punished,” she said. However, when The Signal contacted GSUPD Chief of Police Joseph Spillane, he said the issue was first addressed six months ago. The department began to study the system and found many outdated cameras, but more importantly a variety of disparate systems, resulting in a lack of unity and communication between them. Following this discovery, Georgia State put together the Video Surveillance System Committee, which met every month in working toward a solution. In November and December, a temporary hold was put in place on installing any new cameras until the best solution and way to manage it was found. In December, the committee brought forward a proposal for $2 million in funding that received approval. “We got a purchase order to move forward with a program that over the next couple of years will replace a majority of the cameras on campus but will also integrate all the cameras into one system,” Spillane said. Funding came from a variety of Georgia State departments, including police, facilities, housing, PantherDining and finance. “All of us got together and agreed that we all need to integrate our cameras together and put money into this system,” he said. The project applies to all campuses, replacing old cameras, adding new cameras and shifting all to one system. 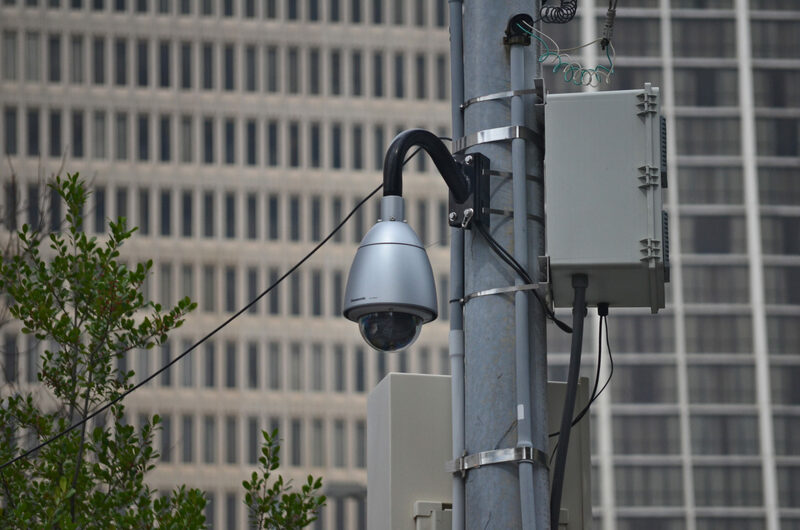 Under the platform Genetec, the new system will be able to communicate with the City of Atlanta’s Operation Shield Integration Center so that APD will also have access to camera surveillance under one system. The new system will enhance a variety of features. This includes the ability to store recordings for 30 days as opposed to the current 5 or 6 day maximum, a 7 day cloud backup, a system put in place to determine when a camera is inoperable and licensing for 2,500 cameras. Spillane said this project takes time because many of the buildings the university inherits already have old systems in place. “For example, the Ted Turner Stadium has a video surveillance system that was installed in 1996 for the olympics, and that system is still operating,” he said. Spillane expects the majority of cameras and the new system to be in place by the end of 2019 with the stadium fully operational by football season in August. However, the project will continue with further funding requests each year, to maintain the system and keep cameras up to date. “It’s multi-year, because every year, there is a camera that gets another year older. Every six years or so, you should be rotating these cameras and replacing them with the latest and greatest technology,” he said. This new initiative will be further enhanced by the completion last week of a $1.8 million project, a new communication center for GSUPD in the basement of 100 Auburn Ave. where the new system will be featured on the video wall. “To answer the question that SGA brings up, there are places where we would like to install cameras and that’s part of this funding that we just got approval for,” Spillane said. SGA President Franklin Patterson is looking forward to seeing the development of these solutions. “I am happy to hear that the school is looking out for its students and happy that funding has been approved to ensure that students are safe on campus,” Patterson said. Correction (01/20/2019): A previous version of this story misstated the cost of the new communication center. It is $1.8 million, not $1.8 billion.